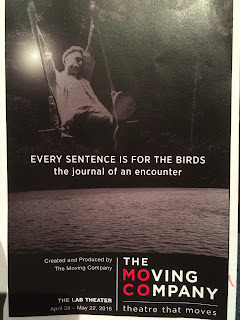 What do you expect from a show that is named "Every Sentence Is For The Birds: the journal of an encounter" and is inspired by the work of Francois Truffaut, Peter Handke, Denis Diderot and Maria Montessori? If you are me, you walk in with an open mind and absolutely no expectations. 75 mins later, you walk out with a wide-eyed look in your eyes, a sense of fascination, and questions, questions, questions that need to be researched. Personally, I LOVE shows like this. I love a show where I leave and I want to find out more about the subject, the inspiration, the writer, the actors, etc. So, where to begin? As the website states, this show is about a brief encounter between a doctor and a "wild child" that evolves into a relationship and explores.....well, a lot. My thoughts are that it explored the building of a relationship between two people who are in a parent/child situation. Doctor Katherine (spelling is assumed) Godschild is walking in the forest and finds "O". She works with him and teaches him language, social skills, concepts, helps him grown and, to put it bluntly, civilizes him. Clearly there is more to it than that however I think that helps explain the core of the story, and why I saw it as a parent/child. Godschild (played by Suzanne Warmanen) sets the tone of the play by coming on, sitting down, and greeting the audience. The set is divided into two halves - the right half has a lab feel to it - two tables, chairs, sink towards the back wall, very white, clean, organized. The left side has two raised platforms with ramps. The back platform is covered in dirt, while the front one is covered in grass. Between these two playing areas is a nice, large, rectangular rug. Warmanen's Godschild (love the name) is so warm, inviting, smart but easy to follow. She explains her start, her inspiration. She is an anthropologist and is going to tell us about an encounter she had. Before that though she gives us background into the definitions of science and art. She explains how at one point in time both words were defined using similar words - human, skill, learning, and how they may have been seen as similar skill sets. Science now is thought of as separating, while art is thought of as joining. After this amazing, smart, and eye-opening talk, she starts the story of meeting "0". In a walk in the forest she hears a noise. She stops, thinking it an animal, and she recognizes that it also stops. She considers that perhaps it is a "wild child" as were found in the forests at times...children that had been abandoned by their parents and grew up wild. She returns the next day at the same time, as does this noise. She sits, and the noise is quiet - as if it is also sitting. Suddenly we hear dirt falling, and shifting, and a hand is reaching out from the pile of dirt. A man appears slowly - dirty and wearing little. Godschild starts building the relationship by leaving a piece of orange - and the rest I will leave for you to see. The man is played by Nathan Keepers. Eventually we get to know him as "0." I can honestly say that I have never seen a performance like this before. The show was conceived by Dominique Serrand (the director) and Nathan Keepers. It was written and created by the two of them and Suzanne Warmanen. We found out post show (during a quick announcement) that they started rehearsals on April 4 and opened on April 22. Watching these two amazing actors work with each other, play with each other, play off of each other - there was some incredible work done in a very short time. Nathan and Suzanne are simply incredible - Nathan in constant movement, exploring the world, learning in front of our eyes, while Suzanne is the constant bedrock, the audiences gateway into the relationship and the play, the eyes we see "0" through. This is the first work by The Moving Company that I have seen and it was so good. (I used amazing and incredible quite a bit already and so am going back to basics...with a LOT of meaning and emphasis). "A storyteller has a personality, a point of view, standards, and passions which lead them to exaggerate or understate. Just tell it the way it is, indeed! That's something that probably doesn't even happen twice a day anywhere. Besides, is the listener any more impartial than the speaker? No. Which accounts for the fact that it scarcely happens twice in any day that people really hear what is being said to them." The next two inspirations, I think, are more about form. Peter Handke is an Austrian writer who tends toward the avant-garde. He also wrote a work called Kaspar which dealt with a foundling who is destroyed by society. Along with Handke, the show was inspired by the work of Francois Truffaut - the French New Wave film director. Now, I have to confess that I do not know the works of Truffaut...yet. So, if you are a fan of Truffaut - let me know if you can see his inspiration in this new work by The Moving Company. 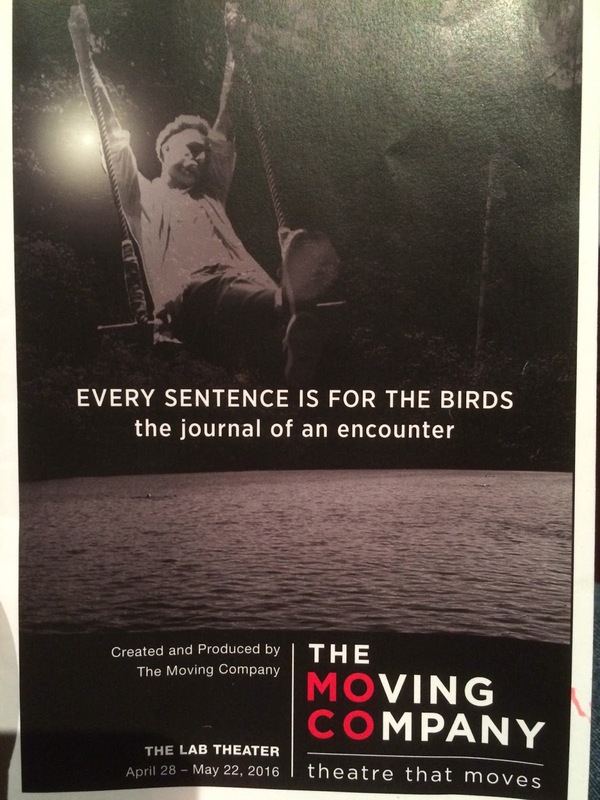 Every Sentence Is For The Birds: the journal of an encounter plays at The Lab Theater till May 22nd. You have over two weeks to see it but don't wait. At 75min, no intermission, and the subject matter - you may want to give yourself enough time to see it twice. There is so much food for thought and such brilliant performances.